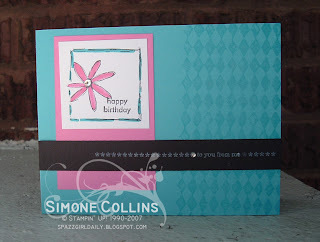 Just a quick birthday card sent out to a fellow blogger. Used a Michaels $1 stamp, love those, wish we had the newer more fabulous acrylic ones at my stores, but these are good too. Colored the image with my fabulous markers. Added Hero Arts Bling to the flower and the other sentiment from All in a Row on the black strip which is stamped in White Craft Ink. Love the card as always. I need to touch base with you to get some good mojo working. Cute card. Love the bling. So what camera did you decide on?? ?